Every direction your turn in the San Francisco Fairmont hotel provides an incredible location to make an image of the Bride and Groom. 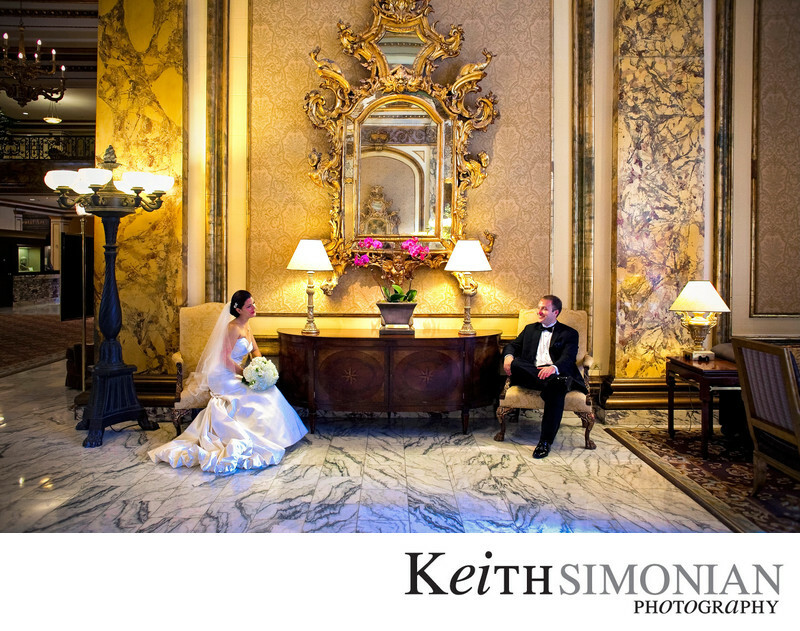 This photo includes the marble tile and gold decorated mirrors in the lobby of the Fairmont Hotel. The trick here was to have the couple seated and ready to go for the photo, and then time it so there were no guest coming through the shot. The couple choose to have their wedding at the Grace Cathedral Episcopal church, and then walk just one block over to the Fairmont Hotel for their wedding reception. Between the church and the hotel is Huntington Park which is a great location to take bridal portraits with either Grace Cathedral church or the Fairmont hotel as a backdrop. The park is bordered by California street which has a line of the world famous San Francisco cable cars. I'm not sure if the cable car will always stop so the newlyweds can take a photo with the cable car in the background, but one did make a brief stop for us while I was taking photos. Of course while I was making photos of the bride and groom with the cable car behind them, the riders on the cable car were taking their own photo of the couple. Location: The Fairmont San Francisco Hotel 950 Mason St San Francisco, CA . 1/100; f/3.5; ISO 2500; 28.0 mm.